Because of its origins in South America, the tomato plant has very few natural pests here in Great Britain although it will suffer the scourge of common glasshouse pests if they are grown under protection. In fact, you are far more likely to experience problems when growing under glass or in a grow bag than you will ever get when growing directly into well prepared soil. 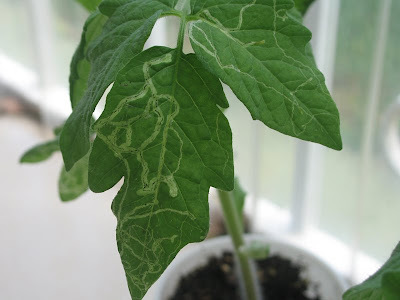 The leaf miner adult - and more specifically the larvae - is one of those pests that can be quite difficult to control on tomatoes irrespective of whether they are grown under protection or not and it's all down to their unusual life-cycle. 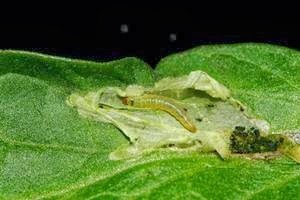 So just how do you control leaf miner on tomato plants? Cause: Leaf miners are small larvae which burrow in between the leaf layers. You may also come across small puncture marks on new leaves caused by the adult females during the feeding and oviposition processes. Sometimes this can also result in a stippled appearance on foliage. Symptoms: Typically the first signs you will come across are white ‘wiggle’ marks in the leaves which is the major form of damage by the larvae, and will result in the destruction of the internal leaf mesophyll. The mine becomes noticeable after about three or four days after oviposition and becomes larger in size as the larva matures. Both leaf mining and the stippling caused by the female adult can greatly reduce the leaf's ability to photosynthesise. Extensive mining can also cause premature leaf drop. Control: Leaf miner are difficult to control using a contact insecticide as they are pretty much out of reach, protected by the leaf membrane. They can be controlled though by a systemic insecticide but then you probably wouldn’t want to risk eating the crop afterwards. This is one of those cases where it may be best to leave them alone - other than picking off and destroying the worst affected parts of the plant. In fact, your tomato plants can have as much as 60% of its foliage affected with leaf miner without affecting the fruit or its growth. After harvesting your crop, you can try double digging the soil where the tomatoes grew as the adult leaf miners experience difficulty in emerging if they are buried. You can try repeating this several times over the winter before re-planting your crops in the late spring. where do these leaf miners come from? I have been in Florida 20 years, and have tried to grow tomato's and always seems to be some kind of pest that destroys them this year is the leaf miner! I have a small veggie garden in pots. But we have a terrible problem with flies. We have it under control indoor but not outdoor, and my plants are all outside. I started noticing those leaf miner lines on my tomato leaves and then researched and saw that it caused by flies. They say you should use that yellow sticky tape to trap the flies to rather lay eggs (larvea) on that than on your tomato leaves. But I have not tried it, and not sure it works.